Can One Teacher Change Your Life? Home > Our Blogs > Facing Today > Can One Teacher Change Your Life? 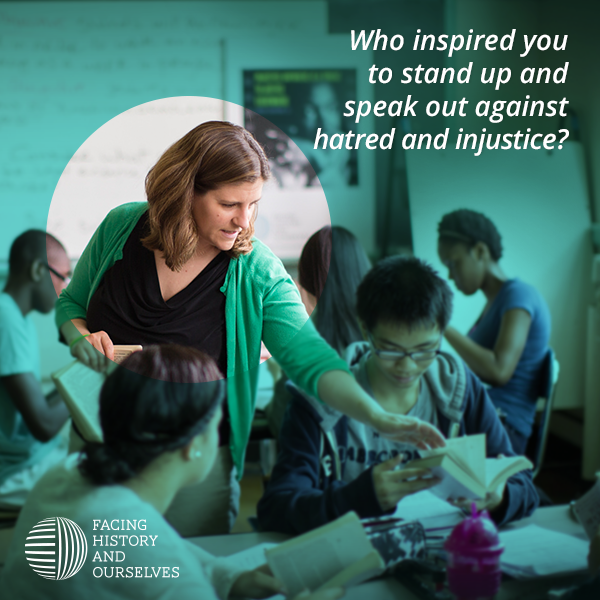 For decades, students, parents, volunteers, and community members have been inspired by their Facing History and Ourselves encounters – whether in the classroom, at public and private events in-person or online, or through any of the teachers or alumni who talk about their transformative experiences from bystander to upstander. Today, we're pleased to announce Facing History Together, a program designed to bring together anyone who has been touched by Facing History to stand up and participate. Named by a Facing History alumnus, Facing History Together will provide opportunities to connect, ask questions, and build conversations about the issues that matter most across districts, states, and countries. We're launching the program with a Teacher Recognition Contest, which gives you the chance to honor the outstanding educators in your life that encourage young people worldwide to be a positive force. Nominations open today and couldn't be easier! Just think back to one of your favorite moments in school. Who flipped a switch in your mind, changed the way you thought, or taught you to think differently about the world? Then click here. Nominations close October 17, so get yours in soon! Once we review the names, we’ll choose 20 semi-finalists and then you’ll have the chance to vote and determine one winner, who will receive a $5,000 grant. We can’t wait to meet your nominee.